The Guardian couldn’t even be bothered to put an image of Labour campaigners over its article – just this one of David Cameron and some turncoat [Image: Yui Mok/WPA Pool/Getty Images]. Rowena Mason at the Guardian ought to win a ‘Bad Journalism’ award for this. Labour’s position on the EU referendum (not ‘Brexit’, as her headline so misleadingly put it) has been clear since before the campaigning began; Labour supports ‘Remain’. David Cameron’s battle? In what twisted universe? Oh. Sorry. That’s right. In Rowena Mason’s twisted universe. In the Guardian‘s twisted universe. As This Blog has made clear many times: The EU referendum is not about David Cameron except in a remote tangential sense. The EU referendum is a question put to the UK electorate – do we want to ‘Remain’ in the European Union or ‘Leave’? It isn’t a vote Cameron can win because he isn’t up for election. And it isn’t his “battle” either, because there are plenty of other people – politicians and layfolk – who are also campaigning on the ‘Remain’ side but will have nothing to do with him and his toxic brand. 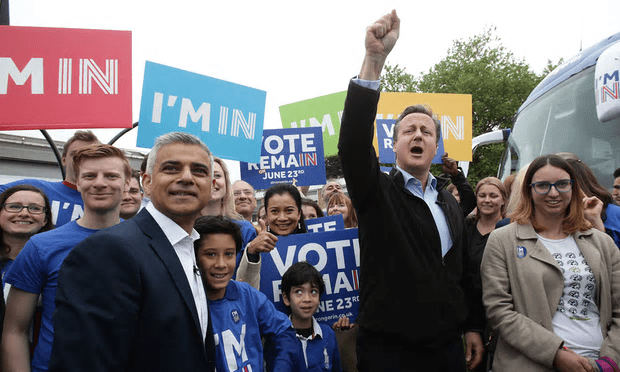 Any Labour MP or public figure seen campaigning with Cameron is betraying the party (and yes, that means you, Sadiq Khan). Remember how Scottish Nationalists twisted Labour’s choice to campaign alongside the Tories in the ‘independence’ referendum of 2014? They successfully convinced many voters that Labour and the Conservatives were allies in Westminster – in defiance of the facts – and stole Labour votes at the subsequent election. That’s why Labour won’t campaign on the same platform as David Cameron now. Perhaps Ms Mason didn’t get the memo. Look at the people on Stronger In’s board – not one Labour politician among them (unless you still believe Peter Mandelson ever stood for Labour values). In fact, Mandelson’s presence makes it more likely that the leaked memo is intended to weaken Labour’s current leadership. Yet the Guardian‘s Rowena Mason is happy to overlook that and be led by the nose. The quality of journalism in the mainstream press has plummeted since This Writer left, hasn’t it? The Grauniad seems to have lost its way. I vote Labour, because in the main they represent my views. However, when it comes to the EU, we have to differ. Since the EU’s conception, as a socialist movement, run for the benefit of the people, it has gradually turned into a neo liberal Conservative state. Each country is fighting the others for its survival and like us under Tony Blair and David Cameron, is gradually removing all the post war benefits. The EU policy is now, the NHS must be destroyed and replaced by privately owned enterprise. The neo liberal policy is that everything must be privately owned, and the proletariat must pay for everything, nothing can be owned by the state. This is why we have strikes in France and our Councils are being stripped of money and assets – already one Council has said it can only provide statutory benefits. All the media seem to focus on is the divisions etc while broadly ignoring the facts. Ok so fights between allies are interesting and fratricide in either camp will always attract comment. In fact the theme has driven interest since the earliest storytellers (Cain and Abel – hell I’m referencing the bible now). But the facts are what most people need to make an informed decision in the referendum and facts are very few and far between when compared with the hyperbole of the two propaganda teams. I usually try to refer people to Fullfacts.org (just google Full Facts) where at least some modicum of informed restraint is offered in presenting the arguments and counter arguments and their accompanying exaggerated statistics. I’m sure committed europhobes would not be swayed as they, like UKIP are usually unable to see past the foreigners coming to little England and those awful straight bananas, but most people who are capable of independent thought will find useful analysis of the facts and interpretation of statistics and dispelling the myths about who does what in Europe. I’m not a fan of Full Fact, since that website made a complete mess of analysing the death statistics for people on sickness benefits. Alternatives include Richard Corbett’s excellent ‘Mythbusters’ page, and InFacts. Its fine to differ, fine to disagree. But it is not a Party political issue.As Mike says its not a vote for Cameron if you vote remain, nor a vote for UKIP if you want out. Its bigger than that. Its for us, the British people to decide. We need information BUT we never needed politicians involved, to tell us what to do. Since you brought up Scottish Nationalists, Mike, I would like to point out that exactly the same tactics were used by Better Together and the media as those now being used by the media regarding the EU vote. One of the main objections Yes campaigners had to face was the fact that Alex Salmond was not liked by a good chunk of the population and the media played on this. I don’t know how many times I heard people say they were voting No because they didn’t like Salmond. It was nigh impossible to make them understand they were voting for Scotland’s independence, not a person or even a party. I sometimes wonder if the vote might have been different if Sturgeon had been in charge then. I know that you despise her but she is many times more popular up here than Salmond ever was. I imagine Remain campaigners are as frustrated as I was in 2014.